The simple answer is no – there are alternative methods to forming market segments, as listed below. 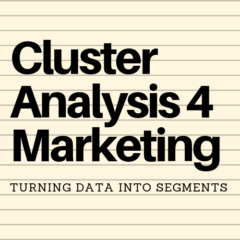 Cluster analysis is simply another tool in the marketing toolbox. It may or may not be suitable for use for your firm/brand depending upon certain factors. If you have a long-standing market segmentation approach with an ongoing successful marketing strategy, then you probably do not need to run clustering as you already satisfied with your market segmentation approach – why change it if it is working well?